The 567 is bringing creative life to downtown Macon through exhibits, art classes, creative events, and small business development. The 567 Center for Renewal is a non-profit community space for entrepreneurs, artists, and musicians who bring a collaboratively creative life to downtown Macon and surrounding areas through events, classes, and business development. We offer an art gallery, classes and workshops. Why should I donate to The 567? The April exhibit at The 567 is the Absolution, featuring abstract paintings by Victoria Phillips. On exhibit through April 26. 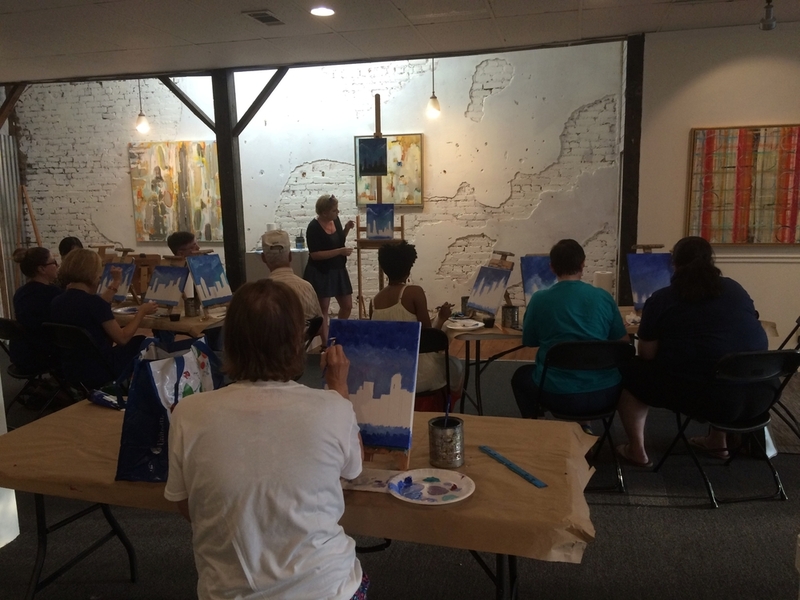 Corks & Canvas is a beginner-friendly painting class for adults where you can sip on your favorite bottle of wine while you paint. The class fee is $28 and includes all class materials. BYOB. Upcoming class dates: April 27 & May 18. Click for our whole calendar of events. The 567 Center Pottery Studio is equipped to provide part-time and professional potters and sculptors a place to practice their craft. Whether you're relatively new to working with clay or an experienced artist, we hope studio membership will provide you the resources you need to create. Membership includes access to tools, equipment, glazes, and firings, as well as a shelf to store your works-in-progress. New artwork added this month in our online gallery! Visit the567gallery.org to see new landscape paintings, sterling silver jewelry, and mixed media work. Mark your calendars! This year’s Young Artist Camp will take place July 15-19 for ages 7-14. In this full-day camp, kids get to experience a variety of art forms, including painting, drawing, mixed media, and pottery. The 567 Center for Renewal is a community space for entrepreneurs, artists, and musicians who will bring a collaboratively creative life to downtown Macon and surrounding areas through events, classes, and business development. -entrepreneurs find the resources needed to start new, successful downtown businesses. Why is it called The 567? The 567 was founded by New City Church, which began holding services at the Cox Capitol Theater in 2008. The church needed additional space for Sunday morning children’s activities and other things, so they rented a small space at 567 Cherry Street. New City Church’s leadership wanted the space to be more than a Sunday space, they wanted a space that served to connect the community and benefit the city. After talking to many people in Macon to understand the city’s history and hope for the future, New City began developing The 567 to be a place where New City and Macon could together celebrate the arts. The original 567 was a huge success in helping to enjoy and shape our downtown’s culture and community as the city united to enjoy music and art. The dream grew, The 567 became its own 501(c)(3), and in 2010, the church and The 567 moved to a much larger building at 533 Cherry Street. With the move came greater opportunities to help downtown Macon grow and thrive through art, music, and business. The church and The 567 have both grown tremendously since then, and it is no longer feasible for The 567 and the church to share space. In 2016, The 567 purchased its own building at 456 First Street and looks forward to growing and impacting downtown even more in the coming years.